The local site effects play an important role in the evaluation of seismic hazard. The proper evaluation of the local site effects will help in evaluating the amplification factors for different locations. This article deals with the evaluation of peak ground acceleration and response spectra based on the local site effects for the study area. The seismic hazard analysis was done based on a probabilistic logic tree approach and the peak horizontal acceleration (PHA) values at the bed rock level were evaluated. Different methods of site classification have been reviewed in the present work. The surface level peak ground acceleration (PGA) values were evaluated for the entire study area for four different site classes based on NEHRP site classification. The uniform hazard response spectrum (UHRS) has been developed for the city of Bangalore and the details are presented in this work. The modification to the seismic waves when it passes from the bed rock to the surface of earth through the overlying soil is termed as the site effects. This depends on the local site conditions and this is one of the major factors which will increase the destruction caused by the earthquakes. When the seismic waves travel through the overlying soil to the ground surface, it may get amplified or de-amplified, and this is known as site effects. The amplification factor at a site is the ratio of the intensity measure (IM, in the present study it is taken as peak horizontal acceleration [PHA]) for a given site condition to that of the reference site (at bed rock). The amplification factors can be determined using two approaches – based on the observed intensity measures and theoretical approach. The first method compares the IM for various site conditions with that of a reference site condition for determining the amplification factors. The theoretical analysis methods will be useful in extending the amplification factor models to the site conditions which are poorly represented in empirical data sets (Annie and Stewart, 2006). The frequency of ground motion, which will be influenced by the site condition, depends on the thickness of the over lying soil deposit also. If the thickness of the soil deposit is small then the amplification will occur for the waves with higher frequency and vice versa. The amplification factors can be evaluated using the observational studies. This method can be divided into two types – using a reference site and without using a reference site. The three important factors which will affect the ground motion are the source, path and the site characteristics. The identification and removal of these effects is the greatest challenge in evaluating the site response. The simplest method to evaluate the site response is to divide the response spectrum obtained at the site with that of the bed rock (reference site). If the recording in the rock is at a close distance to the soil site, then the three governing factors, which will affect the ground motion, will be the same for both the soil site and the rock. However when the reference site and the site under consideration (soil site) are not near by, then the influence of source, path and the site characteristics will be different for these two sites. More over the geometric spreading of the seismic waves will also need to be accounted (Borcherdt & Glassmoyer, 1994; Borcherdt, 1996; Hartzell et al. 2000; Borcherdt 2002). To evaluate the source and site terms simultaneously, a generalized inversion scheme developed by Andrews (1986) can be applied. In the generalized inversion technique a relatively large dataset can be used (Stewart et al., 2003) but the nonlinear response of sedimentary deposits cannot be predicted accurately when the weak motion data are dominating the input data. Another method of site response, which does not depend on the reference site, is based on horizontal to vertical spectral ratio (HVSR). In this method the horizontal component of the response spectra is normalized using the vertical component of the spectra for the site under consideration. 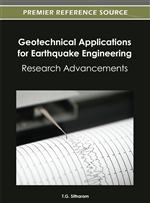 This method can be applied for both the noise recordings (Nakamura, 1989; Field and Jacob, 1993) and the earthquake recordings. The probabilistic seismic hazard analysis (PSHA) will give the likelihood of exceedance of various ground motion levels for a given return period (Cornell, 1968). The attenuation relationships used to predict the ground acceleration levels will give the acceleration values at the bed rock level. These values may change considerably when the surface level peak ground acceleration (PGA) values are evaluated. It has been found that the basins and sediment filled valleys are also having significant effect on earthquake ground motion. Researchers like Field (2000), Lee and Anderson (2000) and Steidl (2000) proposed methods for modifying the attenuation relations for predicting the peak ground acceleration (PGA) and spectral acceleration values at the ground surface level. Stewart et al. (2003) has developed empirical amplification factors for active tectonic regions. They have developed separate sets of amplification factors for different site classes, which were identified using different methods. Even though these amplification factors were developed for active tectonic regions, the same can be applied to other tectonic regions after further studies (Stewart et al., 2003).